How would you like to pay to go shopping? If it sounds like an offer that's too good to be true, that's because, often, it is. Thousands of Southern Californians have been getting emails bearing offers to pay them hundreds of dollars to work as "mystery shoppers." Mystery shoppers pose as real customers in order to review customer service and products at stores, restaurants and hotels. Trouble is,these emails are being sent out by scammers, eager to take your money. Hank Spieker, 79, of Westchester nearly fell for the ruse. "The email look, to me, legitimate, and it kind of piqued my interest," he told NBC4. After responding to the solicitation, Spieker received a second email, offering to pay him in exchange for reviewing a Western Union office. 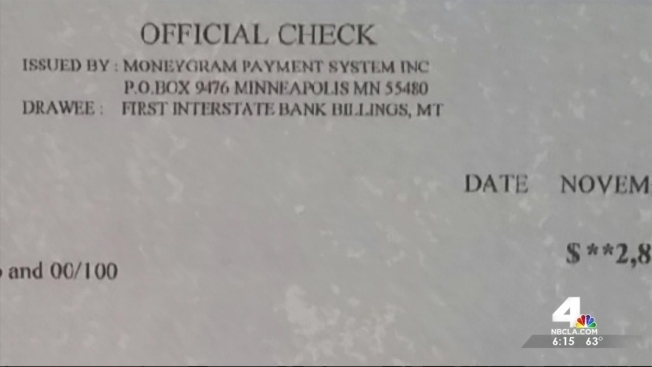 He soon got a check for $2,852 in the mail, which he was instructed to deposit into his own account. Next, he was given 24 hours to wire $1,350 from a Western Union to another "survey agent," then purchase two $500 cash cards to send to another "agent." The leftover funds would be his payment. But he realized the check was fake before he embarked on his mission. Since the check would have taken several days to clear, any money Spieker used would have come from his own account. "It's an interesting scam, because you end up sending your money to these people," Spieker said. Valerie Casares is chief operating officer of Mercantile Systems, a company that hires actual mystery shoppers to survey businesses. She told NBC4 that legitimate programs never pay up front. "Because then I never know if they're going to come through with the survey," Casares explained. Instead, she said, real mystery shopping programs reimburse agents after they've completed their work, and they generally never ask a shopper to spend more than $100. "You may do one shop a month, one shop a year for us," Casares continued. Another red flag is the unusually high payment Spieker was offered. "The most you're going to make on any shop is about $40," Casares said. If you're interested in becoming a mystery shopper, be aware that real programs will never solicit you by email, or offer to pay you before services are rendered. To find a legitimate position as a mystery shopper, Casares suggested checking out the website operated by the Mystery Shopper Providers' Association at www.mspa.org.